Today we are excited to have Tara Sim on the blog! 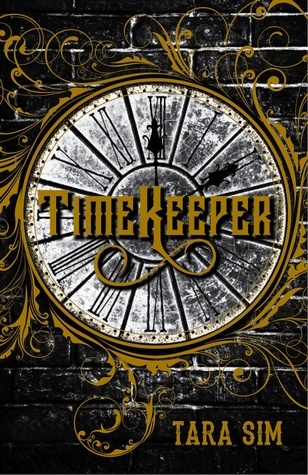 She is a lover of all things magic and the author of Timekeeper which comes out next month. Since we love all things told serially, we had to ask her what her favorite episode was – of anything. She jumped to tell us about her love for a particular episode of Avatar: The Last Airbender, so read on below to find out just what made her heart sing. Order it now at Barnes & Noble or Amazon. Chances are you’ve heard about the wildly popular cartoon series called Avatar: the Last Airbender (and if you haven’t, go and watch it. Go on. I’ll wait.) In fact, it was so popular that the creators even got to do a sequel series (The Legend of Korra), which is also awesome. But the original series has something so raw and creative and genuine to it that I think is almost impossible to mimic, making it one of my favorite TV shows ever made. The third season of Avatar is my favorite, because everything is so intense and awesome. And this is where we see the crux of Zuko’s arc as he attempts to become one of the good guys and joins the Gaang (the main protagonist, Aang, and his friends). However, because Zuko did used to be the antagonist and screwed up the Gaang’s plans several times over, they naturally need some time to get used to him/trust him. Because Aang is the Avatar, he needs to master all four elements—air, water, earth, fire—in order to defeat the Big Bad, who happens to be Zuko’s father. Aang has learned three of the elements, but is still finding it difficult to master fire because of its destructive nature (Aang is a pacifist, and recoils at the idea of hurting anybody). Pretty lucky, right? Well, as soon as Zuko begins to teach Aang about firebending, his abilities suddenly…disappear. Confused and angry, Zuko comes to realize that his shifting alliances have weakened his power, and he needs to visit the original source of firebending in order to rediscover his strength and teach Aang. So Zuko and Aang head on over to a firebending temple, dodging traps and scouting the area. Long story short, they end up becoming prisoners of the native firebending population hidden there, and the only way they can escape is by confronting exactly who they were looking for: the firebending masters. What follows is an incredible sequence where Zuko and Aang work together in order to commune with fire, discovering that the element isn’t only one of destruction, but of beauty and creation and life. Deemed worthy by the masters, they are free to go and resume their training. This is my favorite episode for several reasons: 1. Zuko being a snarky grump; 2. Fire is the best element, okay; 3. DRAGONS; 4. Enemies-to-allies teamwork. It’s a fantastic microcosm to how amazing the entire series is. Again, if you haven’t watched it, what are you waiting for? Tara Sim is the author of Timekeeper (Sky Pony Press, November 2016) and can typically be found wandering the wilds of the Bay Area, California. When she’s not chasing cats or lurking in bookstores, she writes books about magic, clocks, and explosives. Follow her on Twitter at @EachStarAWorld, and check out her website at tarasim.com.